Caramel coated popcorn that induces bliss on contact. 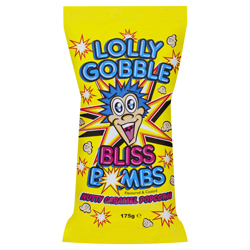 First launched in 1970’s Lolly Gobble Bliss Bombs have gained a huge following and fan base. Sugar, Glucose Syrup (from Wheat), Popcorn (20%), Palm Oil, Peanuts (5%), Salt, Emulsifier (Soy Lecithin), Raising Agents (Sodium Bicarbonate), Colour (E160b), Burnt Sugar. The best thing to eat whilst watching a movie. So yummy! !